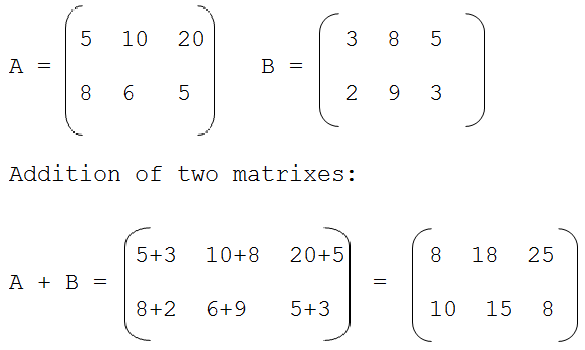 Rule: Addition of two matrices is only possible if both matrices are of same size. why not published the algorithm. very-2 gud solution of dda example of c lang. You have just saved my life. I had a doubt on what gets added with what..
thnx 4 the crystal clear expanation! I am P.Gowrimanogari i have one doubt in c program if i give my name means in input means the entier output screen have to display as for eg: GOWRI .can u tell what concept i have to use???? Shouldn't you check first that whether the give 2 matrices are equal using if-else statements by comparing rows and columns? As only 2 matrice with same no of rows and columns can be added. how can we add 2 matrices without using forloop...........? i want the prog for square matrix can anyone help me?